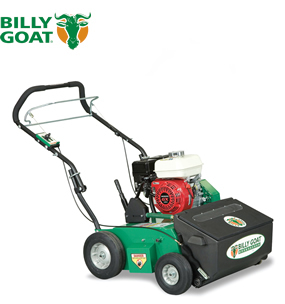 Click on a model below to find details on the different types of Billy Goat Overseeders available. Billy Goat’s overseeder's feature the exclusive Auto Drop system which automatically starts and stops seed drop with bale engagement and disengagement conserving seed and preventing end-of-run seed piling. Billy Goat’s overseeder range reduce fatigue associated with pushing and feature intuitive forward and reverse operator controls. New to the unit is a blade design that reduces thatch and improves blade life due to its sharpened leading edge and attack angle combined with a new foot actuated height adjuster. The OS552 conserves seed with Billy Goat’s exclusive Auto Drop feature by automatically starting or stopping seed drop with bale engagement. 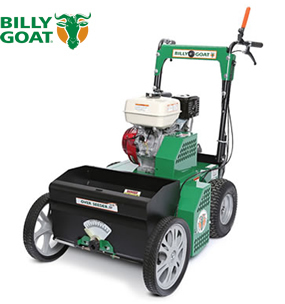 Front positioned 11.3kg (25 lb) capacity seed box and a 20” vertislicing delta reel cuts slits in the ground creating the ideal solution for seed-to-soil.